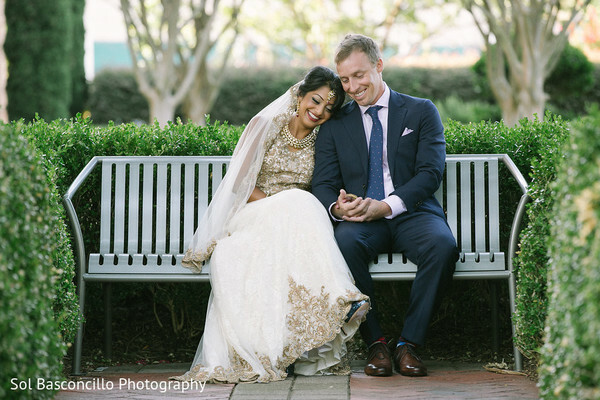 To be completely honest, Sonia and Jason’s wedding compelled us to pause and take a closer look at each click by Sol Basconcillo Photography. 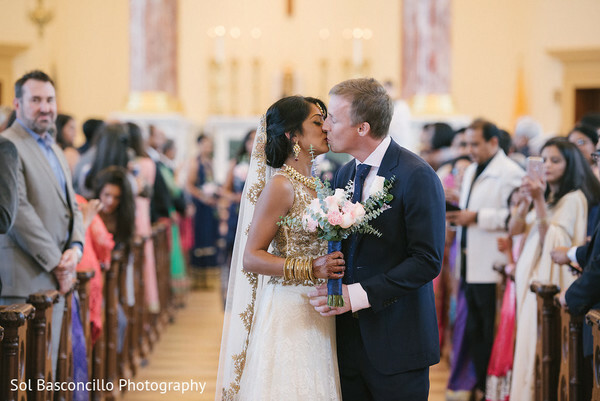 The effort put into blending various elements of the couple’s diverse cultural backgrounds clearly showed. One such was Sonia’s bridal outfit. 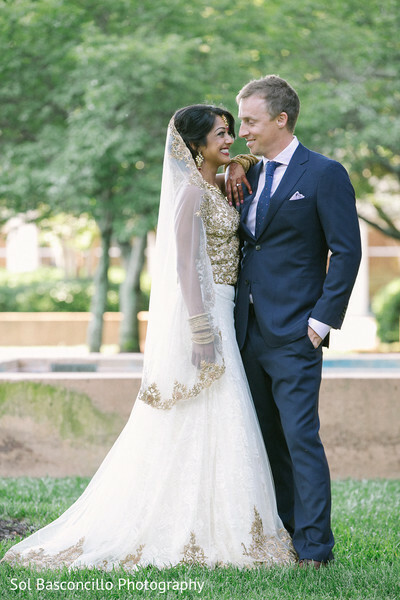 “I knew I wanted something off white, and I wanted it to be more of an Indian style length rather than a dress. Beyond that, I was utterly confused as to what I wanted.” However, Panache by Sharmeen was Sonia’s knight in shining armor, who after several sketches perfected the fully customized outfit. It was the best of both worlds, with an intricate gold bodice, a tulle embroidered veil, and a white lengha with a tulle overlay. We still can’t get over the fact that Cotton Rouge dolled up Sonia in less than an hour, because Sonia looked absolutely ethereal. 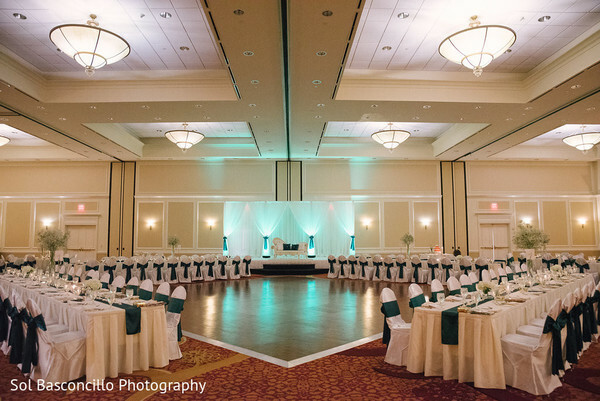 After a traditional ceremony at St Paul the Apostle, the couple and their party were all set to party the night away at Marriott Spartanburg. It was at the reception where we realized what a dream team K.Scott Weddings and Aayojan is! We are head over heels for the mint, sea green, navy blue, and gold color scheme at this reception. It was truly the perfect mix of elegant, chic, and experimental. Aayojan adorned the ballroom with white floral arrangements, giving the whole event a refined look. 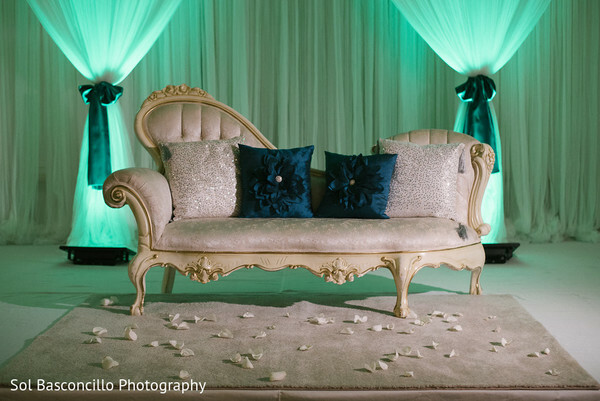 Visit the gallery to check out all the curated photos from this elegant fete! We actually had two friends that were dating. One of my best friends from college was dating his friend from high school and when he met me, he thought that we would be a perfect match! Turns out he was right and from day one I realized I really liked him. I think I knew he was "the one" when he met my brother and they got along as if they had known each other for years. It only took them about ten minutes after they met each other to start ganging up on me! I’m one of those lucky girls that got the proposal story that people will probably be telling for years. It was actually Jason’s birthday and I had planned a whole weekend of nice dinners and fun festivals with some friends but little did I know they all had something else planned. I started the weekend visiting my best friend while waiting for Jason to get into town. We had lunch, some champagne, when she told me she had a house down at the beach she wanted to show me. I, of course, didn’t think anything of it (even when she insisted on doing my hair and makeup to get ready for the night) and we got in her car to head to this “house.” After “passing” the house several times and making several U-turns into the same parking lot for the third time, I noticed someone that vaguely resembled my brother pop out of the bushes. Even then, I just thought he was there to surprise Jason for his birthday. It wasn’t until I saw our good friend, Sol, who also happens to be a photographer, come out from no where did I realize there was probably something big going on. At that point, my big brother led me out of the car and down the beach to where I saw Jason waiting. He gave me a hug and probably said some really sweet things to me but to this day, I have no idea what he said. I do, however, remember observing that he actually had his shirt tucked in for once. I wish I could describe how I felt in that moment when he asked me to marry him but I don’t think there’s a single word that could describe the amount of happiness and love I felt at that moment. I lucked out in that my best friend is in the wedding planning business. She helped me keep track of what all I needed to do and when it needed to get done. And then I found my amazing wedding planner Keisha who made everything so insanely easy for me! She lined up meetings with my venue and communicated with all of my vendors so I did not have to. As far as my decor theme, I knew I wanted something simple. 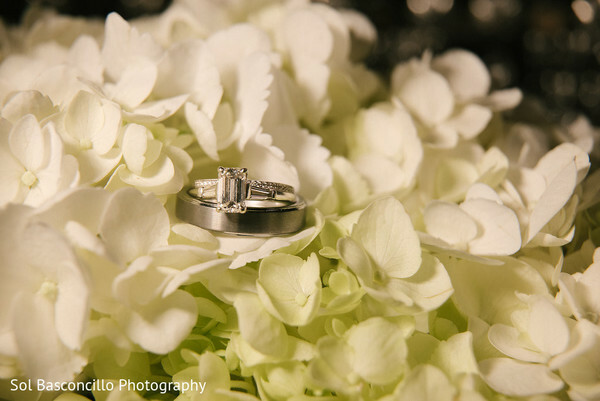 Sarita was amazing because she was able to give me what I wanted and work within our budget. She made it easy to plan once she knew the look I was going for and had an idea of what I wanted. I loved the parts that I got to sit down with Jason and decide things. I'm sure every bride will say that weddings are stressful and overwhelming but it was in those moments where it was just the two of us talking about our wedding that it really felt real! I think most people would say that they loved the cultural diversity of it. So many of our friends had never been to an Indian wedding and loved the opportunity to dress up and take part in everything! I would have to say that would have to be when I said my wedding vows. I just remember that I was already crying and I could barely get the words out while looking at Jason. There was definitely a feeling of overwhelming happiness in that moment. Try to take a moment out during all the wedding craziness to just be with your new husband and really soak in that it's your day! Mine was during our first dance and it was the best feeling in the world! 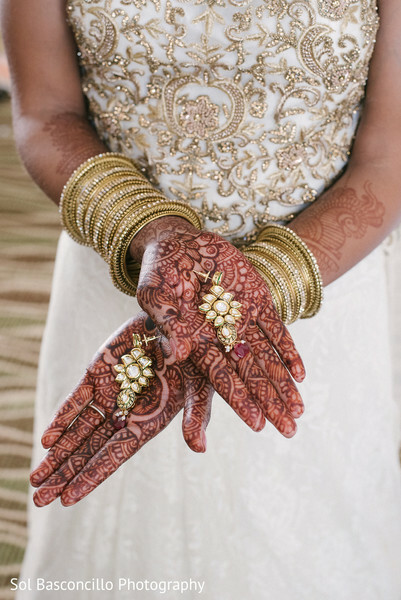 Visit the blog tomorrow for more such enchanting weddings! K. Scott Weddings, Aayojan and Panache by Sharmeen are members of the Platinum Guide. Love what you see? Explore their portfolios.